When you plug in an appliance or flip on a light switch, electricity seems to flow instantly through wires in the wall. But in fact, the electricity is carried by tiny particles called electrons that slowly drift through the wires. On their journey, electrons occasionally bump into the material's atoms, giving up some energy with every collision. The degree to which electrons travel unhindered determines how well a material can conduct electricity. Environmental changes can enhance conductivity, in some cases drastically. For example, when certain materials are cooled to frigid temperatures, electrons team up so they can flow uninhibited, without losing any energy at all—a phenomenon called superconductivity. Now a team of researchers from the University of Maryland (UMD) Department of Physics together with collaborators has seen exotic superconductivity that relies on highly unusual electron interactions. While predicted to occur in other non-material systems, this type of behavior has remained elusive. The team's research, published in the April 6 issue of Science Advances, reveals effects that are profoundly different from anything that has been seen before with superconductivity. "No one had really thought that this was possible in solid materials," explains Johnpierre Paglione, a UMD physics professor and senior author on the study. "High-spin states in individual atoms are possible but once you put the atoms together in a solid, these states usually break apart and you end up with spin one-half. " Finding that YPtBi was a superconductor surprised the researchers in the first place. Most superconductors start out as reasonably good conductors, with a lot of mobile electrons—an ingredient that YPtBi is lacking. According to the conventional theory, YPtBi would need about a thousand times more mobile electrons in order to become superconducting at temperatures below 0.8 Kelvin. And yet, upon cooling the material to this temperature, the team saw superconductivity happen anyway. This was a first sign that something exotic was going on inside this material. After discovering the anomalous superconducting transition, researchers made measurements that gave them insight into the underlying electron pairing. They studied a telling feature of superconductors—their interaction with magnetic fields. As the material undergoes the transition to a superconductor, it will try to expel any added magnetic field from its interior. But the expulsion is not completely perfect. Near the surface, the magnetic field can still enter the material but then quickly decays away. How far it goes in depends on the nature of the electron pairing, and changes as the material is cooled down further and further. To probe this effect, the researchers varied the temperature in a small sample of the material while exposing it to a magnetic field more than ten times weaker than the Earth's. 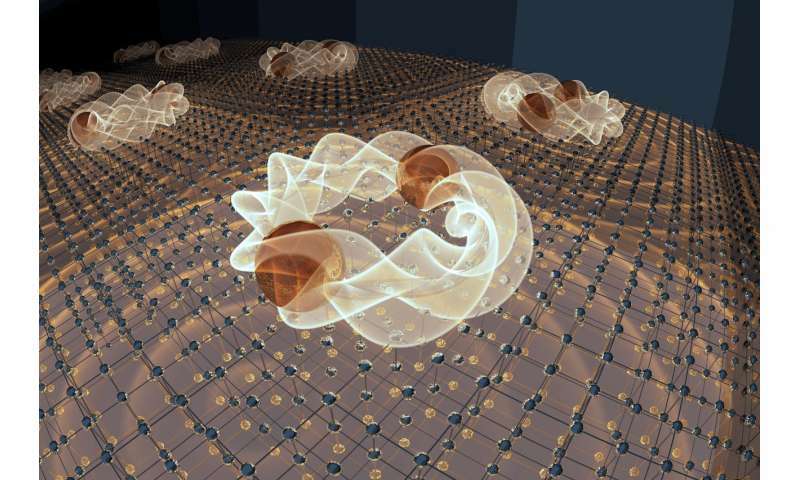 A copper coil surrounding the sample detected changes to the superconductor's magnetic properties and allowed the team to sensitively measure tiny variations in how deep the magnetic field reached inside the superconductor. The measurement revealed an unusual magnetic intrusion. As the material warmed from absolute zero, the field penetration depth for YPtBi increased linearly instead of exponentially as it would for a conventional superconductor. This effect, combined with other measurements and theory calculations, constrained the possible ways that electrons could pair up. The researchers concluded that the best explanation for the superconductivity was electrons disguised as particles with a higher spin—a possibility that hadn't even been considered before in the framework of conventional superconductivity. For now, many open questions remain, including how such pairing could occur in the first place. "When you have this high-spin pairing, what's the glue that holds these pairs together?" says Paglione. "There are some ideas of what might be happening, but fundamental questions remain-which makes it even more fascinating." This superconductor only becames superconducting at temperatures below 0.8 Kelvin, this particular one is no good for general practical applications. But hopefully this surprising discovery would somehow eventually indirectly lead to a better understanding of high-temperature superconductivity. it's all very well investing in super conducting research, but 1 degree above absolute freezing in 2018, the holy grail of superconducting sought over two centuries and research has devolved from several degrees above absolute freezing to below 1 degree above absolute freezing, is this an exercise in how close to the minimum temperature of the vacuum of space. May be its time to change the terms of their research grant and experiment in low temperature material research! To top it all they probed the material with a magnetic field ten times weaker than the earth magnetic field, I ask you 1/10, and they're going to run Maglev on this material? Is this an experiment in exasperation! Electron pairing is a feature of superconductors—their interaction with magnetic fields. As the material undergoes the transition to a superconductor, it expels magnetic fields from its interior. Near the surface, the magnetic field can still enter the material but then quickly decays away. How far it goes in depends on the nature of the electron pairing, and changes as the material is cooled down further and further to below -273.15 degrees centigrade. They really need to change the terms of their research grant at -272.35 degrees centigrade they have achieved the holy grail of low temperature material research!